Miranda is not an alcoholic, but she loves a glass of wine. She recently found out that she is pregnant, but she is unsure whether she can still enjoy an occasional drink. She did some online research and found websites that say it’s okay to have a little wine or a beer once in a while during pregnancy. Miranda wouldn’t mind giving up alcohol for the sake of her baby. But she would also love it if she could drink on certain occasions during her pregnancy. She wants to know for sure. What she and other expectant mothers need to know is that there is no amount of drinking alcohol during pregnancy that is safe and that drinking at all can pose serious risks to the baby. Alcohol and pregnancy don’t mix. Professional treatment can help mothers to be learn to stop drinking If you or a loved one needs help with your drinking, call (888)-459-5511 right away for more information on how to get help. Alcohol is one of the many substances that can have a severe, negative impact on fetal development. When a pregnant woman drinks, it not only affects her but also all the developing organs in the fetus. And, alcohol stays in the baby’s body much longer. For this reason, there is no safe amount a woman can drink during her pregnancy. Any amount of alcohol can reach the baby through the placenta and cause serious harm. According to the Centers for Disease Control and Prevention (CDC), drinking alcohol during pregnancy can adversely affect the physical and mental growth and development of the baby. 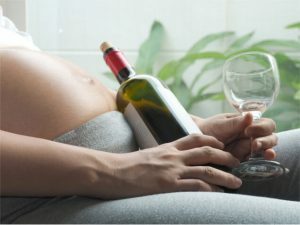 Drinking alcohol during pregnancy is associated with fetal alcohol spectrum disorders (FASDs), a group of irreversible diseases that cause physical abnormalities and impair mental, functional, psychological, behavioral, and cognitive development in the baby. The statistics on FASDs show that many children are affected by drinking. According to the CDC, two to five out of 100 school-aged children in the United States have a form of FASD. 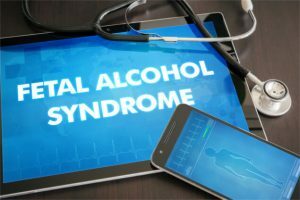 About six to nine out of 1,000 school-aged children in the U.S. are afflicted with fetal alcohol syndrome (FAS), the most severe type of FASD. Drinking alcohol during pregnancy is the only cause of FASDs in children. Fetal alcohol syndrome is one of the most serious potential consequences of combining pregnancy and alcohol. Babies who are born with FAS have permanent damage that ranges in severity but that may affect physical development, physical health, behaviors, intellectual development, and mental and emotional health for their entire lives. The alcohol effects on pregnancy cause children with FAS to grow and develop more slowly than their peers and to have delayed development of motor skills and language. Moreover, these children tend to have memory problems, learning difficulties, and seizures. In addition to fetal alcohol syndrome, drinking during pregnancy can cause other types of FASDs, such as alcohol-related neurodevelopmental disorder (ARND). It causes neurodevelopmental issues, problems with self-regulation and adaptive skills, as well as behavioral problems. Issues with intellectual development can cause children with ARND to perform poorly in school. About 1 in 10 pregnant women reported drinking alcohol during the past month. About 1 in 33 pregnant women reported binge drinking during the past month. 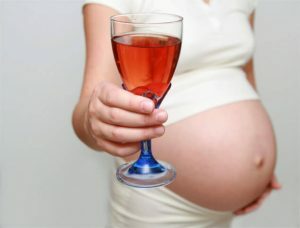 Pregnant women who indulged in binge drinking during the previous month reported an average of 4.6 episodes. Among pregnant women, those aged between 35 and 44 years and who were college graduates reported the highest instances of alcohol use. These statistics are surprising and indicate that there may be a lot of misinformation about how much alcohol can cause a miscarriage and other complications. For instance many women tend to believe that it is okay to drink a glass of wine once in a while during pregnancy. Some doctors may even give the go-ahead to have a drink here and there. And some women falsely believe that it is safe to drink after the first trimester. The fetus is still developing. It is small in size and its organs have not yet developed, so the fetus is unable to break down alcohol as quickly as an adult. The result is that a high volume of alcohol remains in the fetus’s bloodstream for a longer time and impairs the normal development. Women metabolize alcohol at different rates. Different women have different levels of an enzyme that metabolizes alcohol. Those who have low levels of this enzyme break down alcohol slowly. Because more alcohol circulates in their blood, their unborn babies are also exposed to higher amounts of the toxin. Babies have different genetic responses to alcohol. Some babies are affected more by alcohol than others due to their individual genetic makeup. Differences in genes also determine how adults are affected by alcohol. For instance, some adults get intoxicated just after one drink or experience more severe hangover symptoms than another person who had the same number of drinks. When Does Alcohol Affect Pregnancy? Just as there is no safe amount of alcohol, there is no safe time to drink during pregnancy. However, during some periods alcohol can cause more damage than in others. How early does alcohol affect a baby? According to the National Institutes of Health, alcohol is most harmful to the baby during the first three months of pregnancy. The baby’s facial features, anatomical structures, and the brain and spinal cord develop during this period. A 25 percent increase in the chance of the baby being born with abnormal facial features, like a smooth ridge between the nose and the upper lip and narrow eye openings. A 12 percent more likelihood of the baby having a smaller-than-average head. A 16 percent increase in the chance of the baby having a low birthweight. An increased risk of neurological abnormalities, a development that is usually associated with the presence of facial abnormalities. According to researchers at the University of California, San Diego, the developing fetus is harmed the most when the mother drinks during the second half of the first trimester. A 68 percent increase in the risk of the baby being born smaller than average. An increased risk of complications like abnormal brain development, breathing trouble, and difficulty regulating body temperature. An increased risk of neurological abnormalities. It is not even safe to drink during the third trimester. During this period, alcohol will only increase the risk of a premature delivery and the risk of other complications. In addition to the continuing development of the brain and spinal cord, the baby’s lungs are also maturing during the third trimester of pregnancy. Drinking excessive amounts of alcohol during this period leads to an increased risk of premature delivery and an increased risk of physical complications in the baby that may require longer hospital stays and supervision by a critical care team. Stay away from all drinks containing alcohol, which includes wine, beer, wine coolers, mixed drinks, and liquor. Stop drinking before becoming pregnant. According to the CDC, about half of the pregnancies in the U.S. are unplanned, and many women do not realize they have conceived till four to six weeks into the pregnancy. Avoid events and social engagements where people will be drinking. Stick to soft drinks at parties and events and ask friends and family to be supportive. Avoid the temptation to make the switch to non-alcoholic beers, wines, or other drinks. According to research, such drinks might contain a higher percentage of alcohol than what is indicated on the labels. Do not stock alcoholic drinks at home. This ensures there is nothing harmful to drink even if cravings strike. Seek professional help if stopping is too hard to do alone. All women who are pregnant or who may become pregnant need to be aware of the serious risks of pregnancy and alcohol consumption of any amount at any time. There is no safe amount to drink, and alcohol should be entirely avoided. Treatment programs can help women stop drinking when they are ready to become or are pregnant, even those who are not alcoholics. For more information about the options call (888)-459-5511 today.